A 19-year-old woman presented to the hospital with complaints of progressive shortness of breath, chest pain, and lower extremity edema over the past month. Additional complaints included alopecia, oral ulcers, and bilateral knee arthralgia. 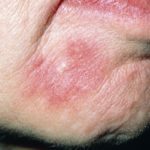 Significant findings on examination included elevated blood pressure (150/90 mmHg), malar rash, and diffuse anasarca. Her initial laboratory values were notable for hemoglobin of 9.0 g/dL, platelet count 116,000/μL, and serum creatinine 2.68 mg/dL with 3+ protein and 3+ hemoglobin on urinalysis. 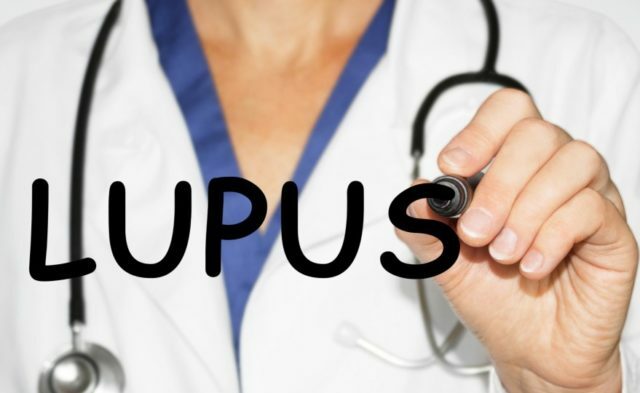 The patient tested positive for anti-cardiolipin immunoglobulin M (IgM) and IgG, but negative for lupus anticoagulant and β2-glycoprotein. 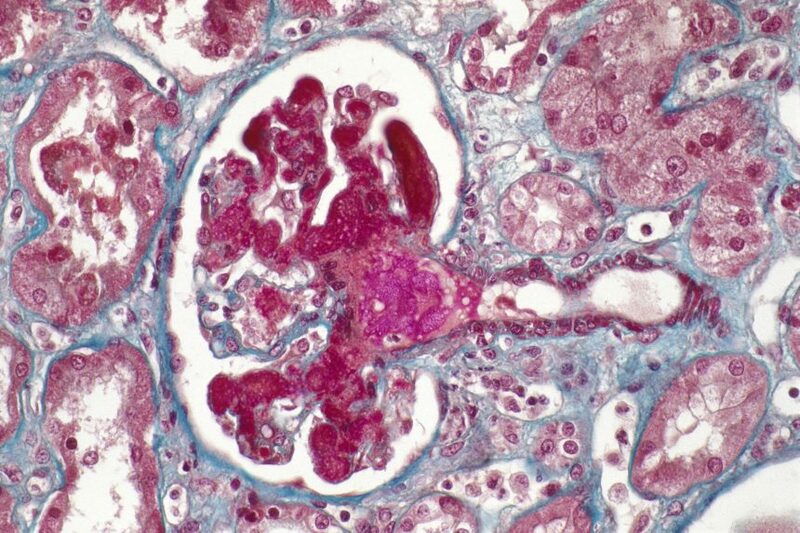 A renal biopsy was preformed revealing diffuse proliferative glomerulonephritis with active crescents involving 7 out of 24 glomeruli on light microscopy. In addition, there were fibrin thrombi with fragmented red blood cells within several glomeruli. These were accompanied by mesangiolysis, endothelial swelling, and extensive wrinkling of the glomerular basement membrane. Ultrastructural studies revealed small subepithelial deposits in the majority of the capillary loops examined, suggesting concurrent early membranous nephropathy. On immunofluorescence study, there was granular staining of capillary walls and mesangial regions for IgG (4+), IgA (2+), IgM (2+), C3 (4+), and C1q (4+). Thrombi stained positive for fibrinogen. Overall, findings were consistent with lupus nephritis class III and IV with thrombotic microangiopathy (TMA). She received 3 days of pulse glucocorticoid steroids (1 g intravenous methylprednisolone), followed by oral prednisone 60 mg daily. She was also started on intravenous cyclophosphamide. After 1 week of therapy, her renal function did not improve significantly. Her hemoglobin and platelet levels also continued to decline, reaching 6.8 g/dL and 56 k/mcL, respectively. A peripheral blood smear was reviewed showing 2 to 3 schistocytes per 50x high-power field. Further laboratory evaluation revealed haptoglobin <30 mg/dL, lactate dehydrogenase 337 U/L, and a weakly positive direct Coombs test. ADAMTS13 activity was 74% (normal: >61%). The patient was started on eculizumab infusion. After 6 months of eculizumab, cyclophosphamide, and glucocorticoid steroids, the patient’s hemoglobin and platelet levels improved to 11.2 g/dL and 160 k/mcL, respectively. Her creatinine level also gradually decreased to 0.7 mg/dL. Which of the following is the most likely cause for this patient’s anemia and thrombocytopenia?